There’ve been rumors for a few months about a potential partnership between Yahoo and Yelp; on Wednesday, those rumors came to fruition with the release of integrated Yelp listings, reviews, and star ratings within Yahoo search results. Yelp photos and listings information is shown at the top of the results page, with star ratings and reviews beneath the basic business information—following a similar format to what Yelp shows on their own site. A list of regular search results appears next to the Yelp content. 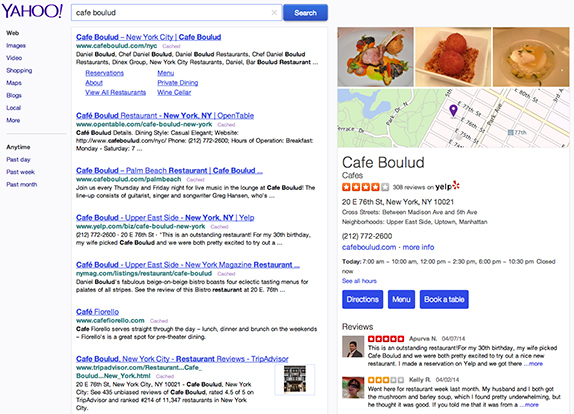 Key Takeaway: Both Bing and Yahoo are now integrating Yelp listings into their search results, and Google is a step ahead of the pack with the release of integrated menus. If you haven’t claimed and perfected your business listings on major publishers yet, now is the time! Take advantage of the latest technology by making sure that accurate, engaging information about your business is everywhere potential customers are looking. Facebook has been pushing a number of design changes to its site lately, including a complete News Feed overhaul. This week, they began rolling out an updated look for Business Pages as well. The new design includes a large right column with Posts and a left column with information about the brand or company. This revised layout makes it easier to users to follow the flow of Posts in chronological order, without having to jump back and forth between two columns as the previous design required. Page Administrators can also view a revamped Metrics section that includes Likes, Post Reach, ad stats; soon, this section will also include a Pages to Watch feature, which allows you to benchmark your Page’s stats against those of similar Pages in your industry. Key Takeaway: While not everyone is thrilled about the News Feed redesign, the new Pages design definitely helps improve the flow of content and makes it easier for Page Admins to check up on their stats at a glance without having to click into the Insights panel. These changes should help small business Page owners present content more effectively, and help their followers interact with their content more seamlessly. Instagram has long been used to share photos with friends, family, and strangers across the web, but it was never designed to be an ecommerce platform. However, businesses are now taking advantage of the social network to engage consumers with visual marketing and drive online purchases. For Fox and Fawn, a local small business in Brooklyn, Instagram marketing was purely an experiment at first. Now, after a year and half of posting, the store sees 20-40% of its daily revenue coming from purchases made by Instagram followers. Other brands have also found ecommerce success on Instagram, citing that the platform feels more “intimate” and “personal” than Facebook or Twitter, where brands tend to sell more directly to consumers via ads or sponsored posts. Key Takeaway: The power of visual marketing isn’t going away any time soon, and Instagram is taking off as a great social network for both shoppers and marketers alike. If you sell items for your small business online, Instagram might be a good platform for you to try out if you aren’t already.